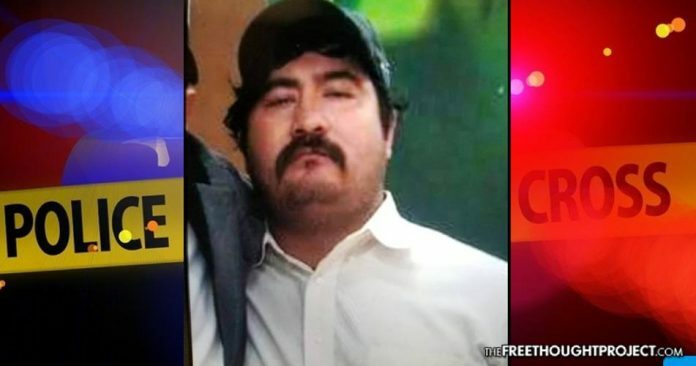 Oklahoma City, OK – In an extremely heartbreaking story, on Tuesday, Oklahoma City police shot and killed a deaf man after responding to a reported hit-and-run accident. Witnesses claim that they warned police that the man was deaf – but officers opened fire anyway. Police alleged that Magdiel Sanchez, 35, was spotted near a vehicle matching the description of the vehicle involved in the incident, and confronted a man standing near the car who they claim was holding a stick – who did not respond to their warnings. A neighbor told AP that Sanchez was either deaf or hard of hearing, and carried a stick with him as protection from stray dogs. Witnesses to the killing are on record stating that they informed the police that the man was deaf prior to them opening fire and killing him. Another local resident said that Sanchez used written notes to communicate, adding that she often saw him with the stick. According to Oklahoma City Police Capt. Bo Mathews, Oklahoma City Police Lt. Matthew Lindsey went by the house and spotted 35-year-old Magdiel Sanchez holding what appeared to be a large stick near the porch. Note that this is how law enforcement attempt to lay the groundwork for their defense, by claiming the catch-all phrase, “I was in fear for my life,” which essentially gives officers carte blanche to kill anyone. Police claim that after backup arrived they ordered Sanchez to drop the “weapon” and get on the ground, but instead he held up the stick and continued towards them. Ironically, a similar, but less fatal incident, occurred in Oklahoma City in 2014, with the deaf victim being severely beaten. During that incident, another deaf man Pearl Pearson Jr., 64, who was also a diabetic, was beaten and arrested by police officers as they yelled at him to stop resisting during a traffic stop. In that incident, Pearson’s driver’s license clearly indicated he was deaf, and he also had a placard in his driver’s door that clearly stated, “Driver is deaf”. When Pearson pulled over and rolled down his window, expecting an officer to ask for this identification. An officer struck him in the face before Pearl had the chance to do anything. After Pearson was beaten by police, he was arrested and charged with resisting arrest. He was thrown in jail, and, according to his family, an interpreter was never provided while Pearl was under the care of law enforcement — not during the booking, hospital, or time at the jail was an interpreter provided — even though Pearl requested one. Pearson has no criminal record, and in fact is a father to a police officer, his son-in-law is also a cop. In 2015, Pearson was given an award for his amazing service to the community for working with people with disabilities. And while police officials now attempt to deflect responsibility for the killing of Sanchez by claiming that he was armed with a metal pipe in his right hand, which was wrapped in some type of material, the reality is the poorly trained officers, with a shoot first ask questions later mentality, are all too common. So, police now want you to believe they killed the deaf man because he refused to listen to their commands and came at them holding a metal pipe – and that they couldn’t hear the numerous people yelling at them to inform them that Sanchez was deaf. Mathews said that there were no operational body cameras on the scene at the time of the shooting, and that officers only learned that Sanchez was deaf and couldn’t hear their commands — after the shooting. Police officials now acknowledge that the driver of the vehicle involved in the hit-and-run was actually Sanchez’s father and that Sanchez was not in the vehicle. In typical fashion, the shooter, Sgt. Barnes was placed on paid administrative leave as the investigation into the shooting continues – but we all know how this plays out. The police will investigate themselves, and find that they did nothing wrong, as usual. Sadly, while a family grapples with the tragic loss of a loved one, it’s unlikely there will ever be justice for Magdiel Sanchez, as the thin blue line always protects their own.